I had to post a WOW this week because I wanted to spread the word about this book! About the Book: (From Goodreads) BROOKLYN: Andi Alpers is on the edge. She’s angry at her father for leaving, angry at her mother for not being able to cope, and heartbroken by the loss of her younger brother, Truman. Rage and grief are destroying her. And she’s about to be expelled from Brooklyn Heights’ most prestigious private school when her father intervenes. Now Andi must accompany him to Paris for winter break. GreenBeanTeenQueen Says: I read A Northern Light last semester for my lit class and I loved it. (Read my review!) I squeeled with excitement over the news that another YA novel would be coming from this talented author and I can't wait to read it. September seems so far away now! Sounds a bit like SARAH'S KEY. Going on my list! I can't wait! I'm so glad Jennifer Donnelly has finally written another YA! This does sound good. I'll have to push Northern Lights to build an audience for it. OMG! New Jennifer Donnelly! Thanks for posting about this! Thanks for posting. This will be going on my TBR list!! I loved A Northern Light...definitely going to add this to my TBR list. This one is on my TBR list. I find this to be a fascinating and tragic time period. I am doing a French historical reading challenge and I hope to read Revolution as part of the challenge. Great pick! Im in the minority but I am not thrilled about this book. Love Donnlley (taught in Otselic Valley) were Grace Brown was from. Loved A Northern Light but these time slip novels don't do it for me at all. I'm passing. If she writes straight up historical fiction YA again I be interested. Oh, I'm reading A Northern Light right now and I love it! Can't wait for this one. I love love love A Northern Light! 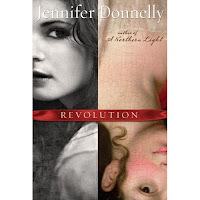 I was so excited to see that Jennifer Donnelly has another book coming out! Wooo! This one sounds so good. I already put it on my list. Yay!